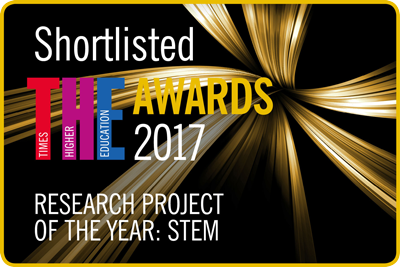 Liverpool John Moores University (LJMU) is one of six institutions shortlisted for Research Project of the Year: STEM in this year's Times Higher Awards. The nomination has been awarded for the use of the SPRAT spectrograph in the study of the unique recurrent nova M31N 2008-12a in the Andromeda Galaxy. SPRAT (SPectrograph for the Rapid Analysis of Transients) was designed and built in late 2014 by the LJMU telescope group. It uses volume phase holographic gratings to maximise efficiency and has proved to be a powerful tool for transient classification with minimal human intervention. Novae are binary systems consisting of a white dwarf that is accreting material from its companion star. The build-up of material on the surface of the white dwarf eventually leads to a thermonuclear explosion. Some so-called recurrent novae show repeated nova eruptions, but until recently the fastest recurrence timescales were in the tens of years, with the typical timescale being much longer. M31N 2008-12a has a nova eruption every year — an unprecedented recurrence timescale. The research team at LJMU's Astrophysics Research Institute, along with their collaborators, have demonstrated this is due to the combination of a huge companion star and the most massive white dwarf ever detected in such a system, leading to an extremely rapid mass transfer rate. The high cadence spectroscopy from SPRAT has been crucial in understanding the nature of this object, and it is predicted to be the first of a whole new class of "rapid recurrent novae". Since the nova event does not completely eject the accreted material, the white dwarf continues to increase in mass, with a catastrophic Supernova Ia event being its eventual fate. The conservative upper limit on the timescale for this event is 20,000 years. The awards ceremony will be held at the Grosvenor House Hotel in London on 30th November. The ARI previously won this award in 2007 for its RINGO optical polarimeter instrument on the LT.